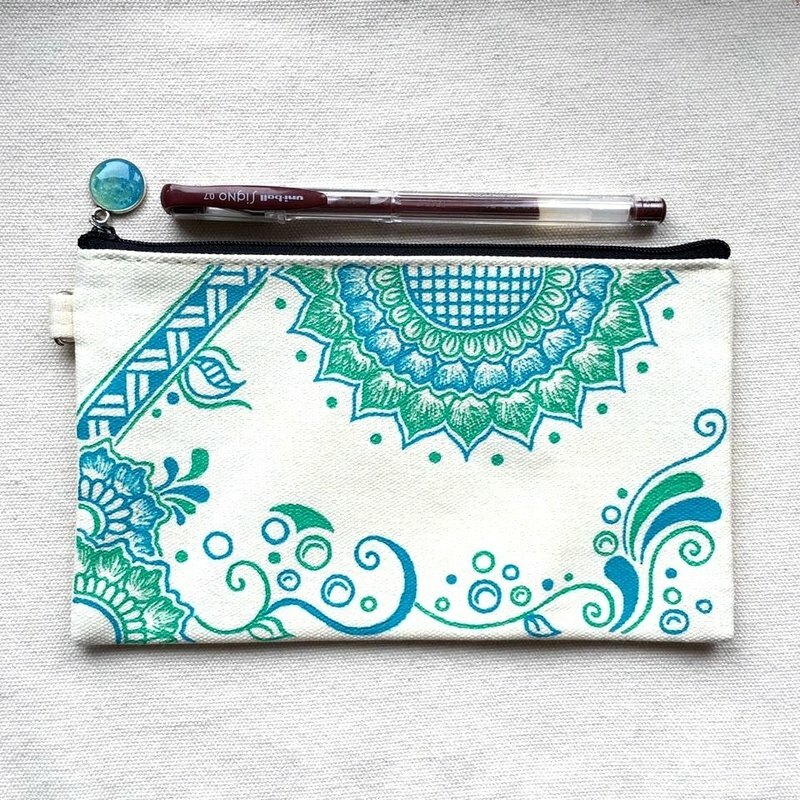 Hand Painted/ Hand Drawn Henna bag, Mehndi Pattern Cotton Zipper Pouch, Coin Purse, Pencil Case, Phone Wallet, Cosmetic Bag. Do you wish to have a artistic and stylish zipper pouch? Finding a special practical gift? Here you are. - fashion elements into traditional art - Size: 195x120mm - Can accommodate big size phone, multipurpose use like a wallet, pencil case, cosmetic bag, else...... - Tiffany Blue and Cyan color on White base Hand Painted/ Hand Drawn in modern henna mehndi style on cotton canvas zipper bag. The zipper button also handmade by me. This item provide add name service, please see follow link and purchase together. https://www.pinkoi.com/product/o6skiJeU Made to order. To wash by hand, Avoid machine washing. Since each Zipper Pouch being hand drawn/ hand painted, please understand each would a little bit different from the photo and may be minor imperfections. Allow to choose the pattern in other color or any customize you wish, please feel free to contact me. -order process- 1. add to cart and purchase 2. please kindly double check the shipping address 3. I would start to work out immediately after received the order 4. making and handling within 5 business days ◈◈◈Shipping promotion offer◈◈◈ Place an order more than one item of my shop, shipping for the second item is FREE! -shipping- I use e-Express Service or Air Registered Mail by Hong Kong Post Office Delivery Time: It will take 7 to 14 working days for mail items to reach recipients (subject to flight availability and progress of customs clearance and aviation security check, etc.). Mail items will be treated as priority mail in the destinations, speeding up mail processing.